Halloween 2016 Costume Contest Winners | Take Back Halloween! Announcing the winners of our 2016 Costume Contest! Thank you so much for your patience in the wake of recent events. All the winners will be uploaded to our 2016 Costume Contest Winners album on Facebook. 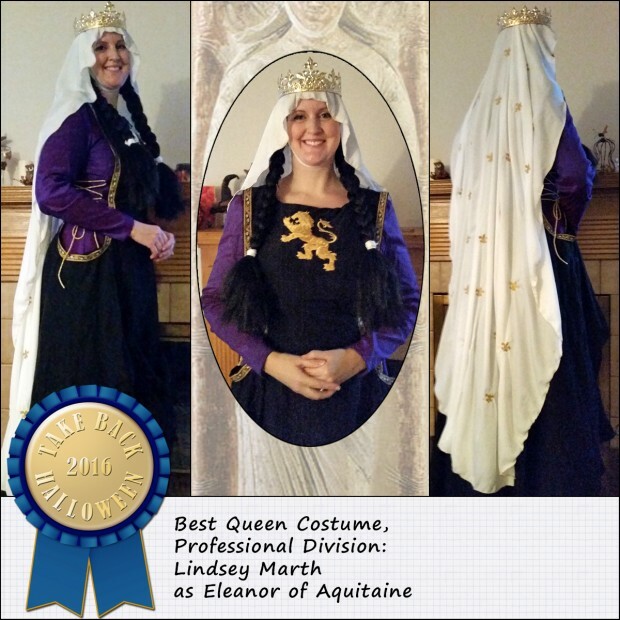 You can also review all the entries this year in our 2016 Costume Contest Album. The prizes track pretty closely with the original contest announcement, with a couple of slight adjustments, as usual. We didn’t get any Professional Division entries for Notable Women, but we made up the difference by adding a Glamour Grrl category to the Junior Division. (I think next year I may re-label the professional division as the “expert” division, since what we’re trying to capture is a skill level rather than an income stream.) The Special 2016 Division is rounded out with honors for this year’s unique achievements. I will be emailing the winners with official notifications and Amazon gift certificates over the next couple of days. Thank you all for participating in the contest and sharing your wonderful creativity. These are the prize categories that we award every year. 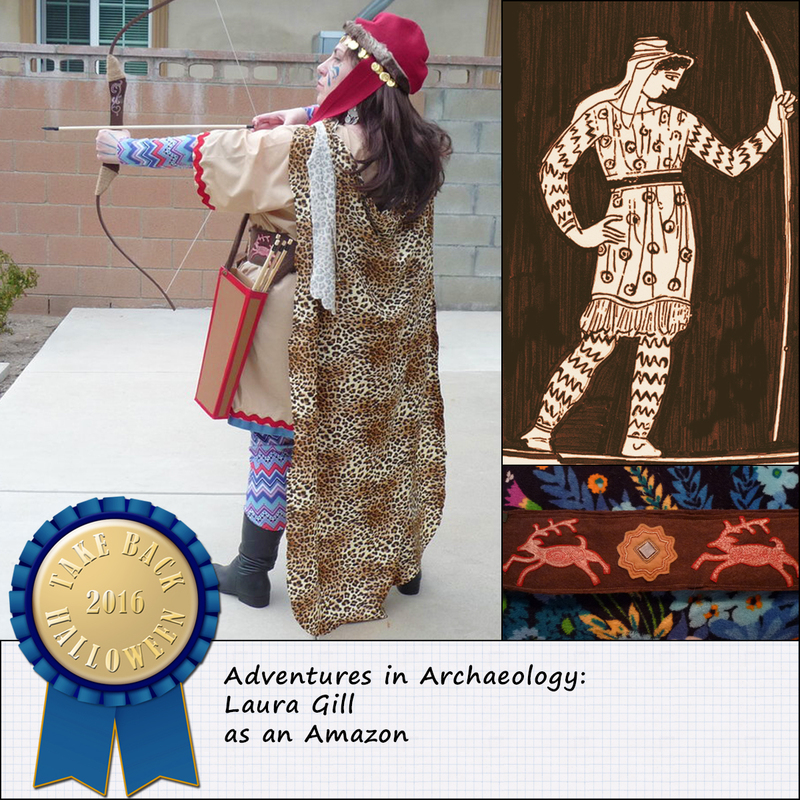 They’re based on our own costume categories here on the website: glamour grrls, goddesses and mythological figures, queens, and notable historical women. 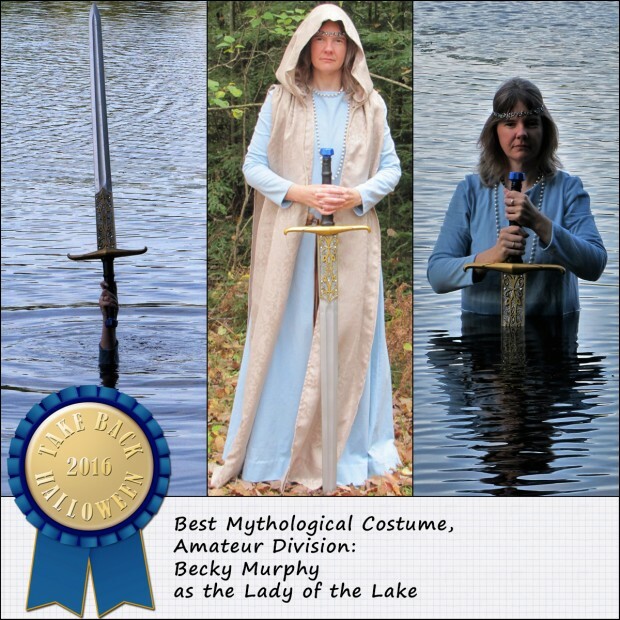 Winner: Becky Murphy as the Lady of the Lake. Strange women lying in ponds distributing swords may not be a good basis for a system of government, but it does make for a great photo shoot. Becky’s costume is great too, and very resourceful. The cloak is actually a set of curtains with an attached valance, re-fashioned to form a hood; the sword pommel is the repainted top off a bottle of salad oil. 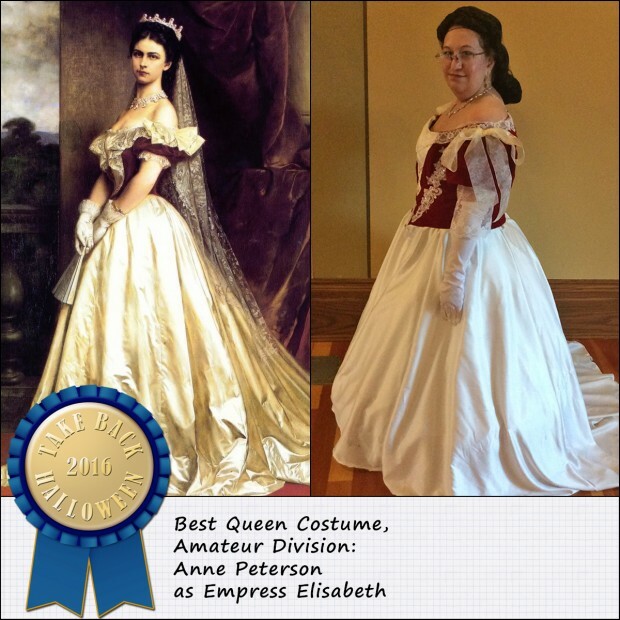 Winner: Anne Peterson as Empress Elisabeth. Anne’s costume recreates the Hungarian coronation gown worn by Empress Elisabeth of Austria (“Sisi”) in 1867. Sisi’s gown was a frothy, pearl-encrusted extravaganza that is a favorite subject today for historical costume enthusiasts. The amazing thing is that this costume is only the second dress Anne has ever made. Way to go, Anne! Really impressive. 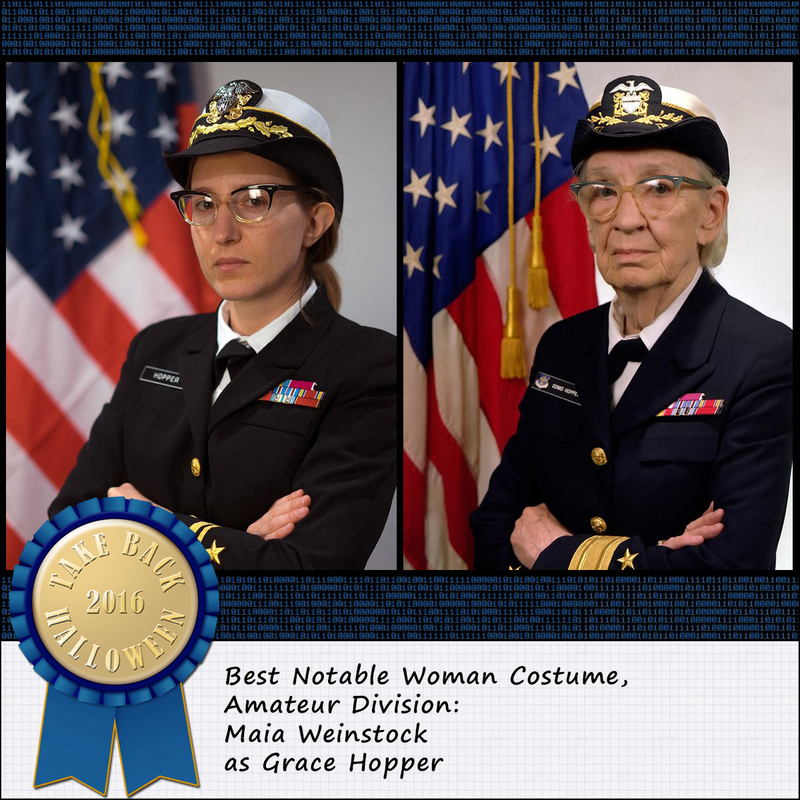 Winner: Maia Weinstock as Grace Hopper. 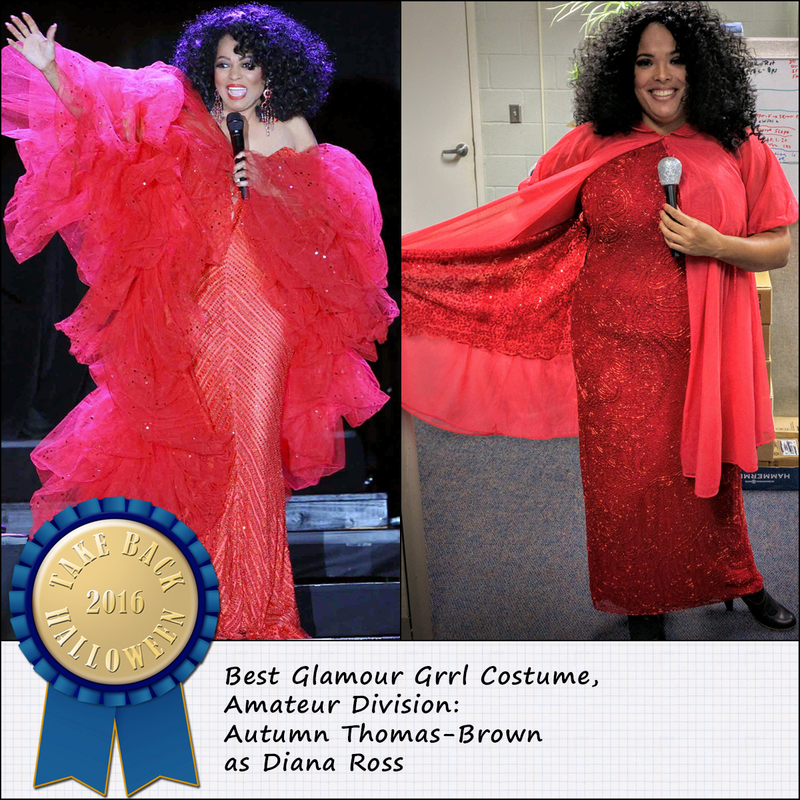 Winner: Autumn Thomas-Brown as Diana Ross. Autumn takes the prize in this category for the second year in a row with her modern Diana Ross ensemble. She writes: “I found a red beaded dress, red chandelier earrings, the curly ‘big-hair’ wig, the sparkly glitter eyeshadow, the fake eyelashes, the chiffon jacket (with a sequined underlayer to mimic the sparkle she has), and the microphone, of course.” You look fabulous, Miss Ross. 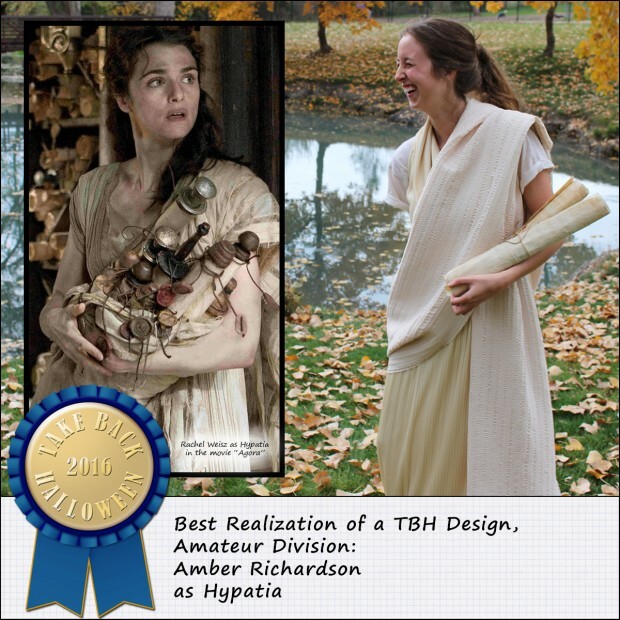 Winner: Amber Richardson as Hypatia. Our Hypatia page gives instructions on how to recreate the costumes and props from the movie “Agora” using ivory crinkle fabric and DIY scrolls. Amber did a terrific job here, cannibalizing an old 1980s formal gown for the crinkle fabric and draping a long philosopher’s cloak around herself. She really looks the part! Very nicely done. 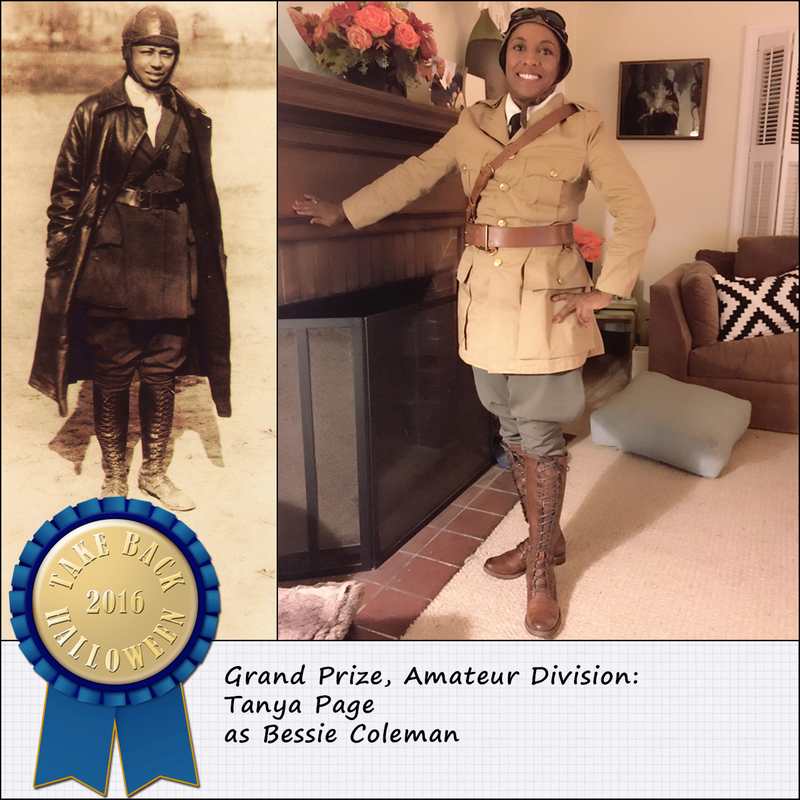 Winner: Tanya Page as Bessie Coleman. Judging a costume contest is always hard, but one thing that makes it easier is when someone sends in a costume that’s perfect. Literally perfect. Everything about Tanya’s ensemble is flawless, from head to toe. She writes: “Having learned that Bessie chose a clothing style that was based on military officer’s uniforms of her day (just pause and reflect on how amazing THAT is), I wanted to replicate her outfit with as much authenticity as I could. My costume is a combination of replica WWI officer’s uniform and actual vintage pieces. The best part about wearing the costume was the opportunity it gave to educate people about this Notable Woman who has been largely forgotten. Bessie Coleman is my personal hero, and I want everyone to know what she accomplished and the obstacles she overcame to do so.” We couldn’t agree more. 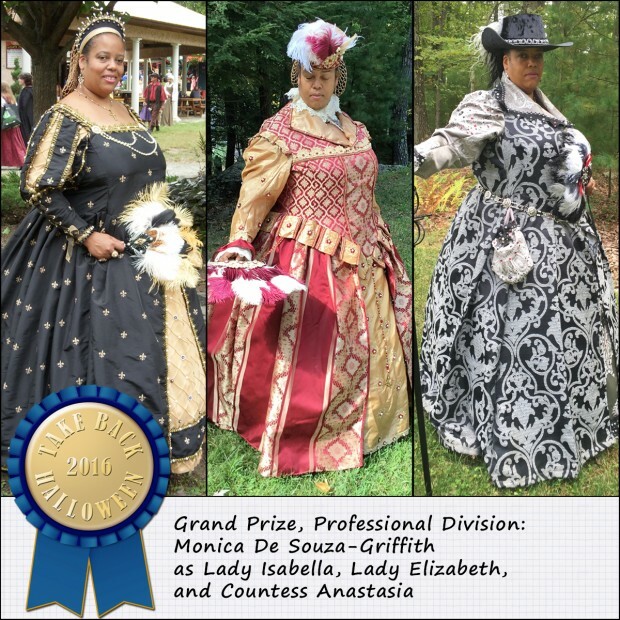 These are the same category prizes as above, but this division is for cosplayers, Renaissance Faire performers, expert seamstresses, and others with professional-level skill. 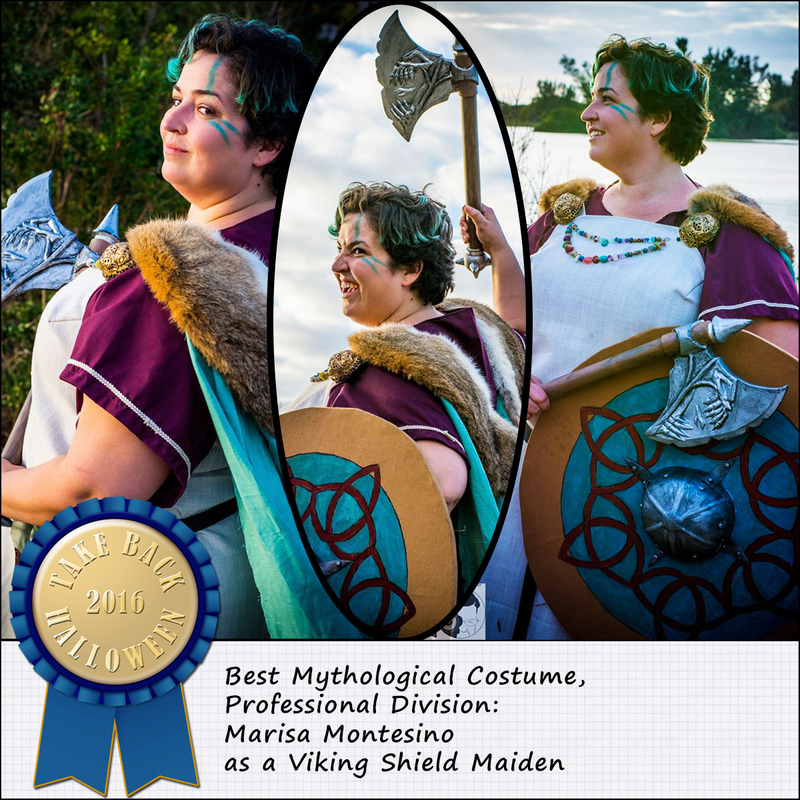 Winner: Marisa Montesino as a Viking Shield Maiden. Marisa’s interpretation of a Viking Shield Maiden is both fun and ferocious. She writes: “I made the whole dress, apron, cape, belt, bag, gold turtles (broaches made of half styrofoam eggs covered in sculpt, designed and painted) and beading, and shield. The axe I found at a thrift store and repainted.” Marisa also did the wonderful embroidery on the apron and dress. Winner: Lindsey Marth as Eleanor of Aquitaine. Lindsey writes: “Eleanor has been an inspiration to me for many years so I was excited to finally get the chance to emulate her and make an outfit in this style that I’ve never done before! The gown is made of two-tone royal iridescent purple/blue shantung with hand-covered buttons at the cuffs. The tunic-overdress has a lion embroidered on the silk fabric (similar to her coat of arms), thin jacquard trim on the sides, and gold cording for side tying. I decided to do the barbette and veil like on her effigy because I wanted to do some fun long braids. The veil was a particular challenge because I wanted to add some detail and also to indicate her royal status so I embroidered fleur de lis in metallic gold thread on the veil.” Gorgeous! 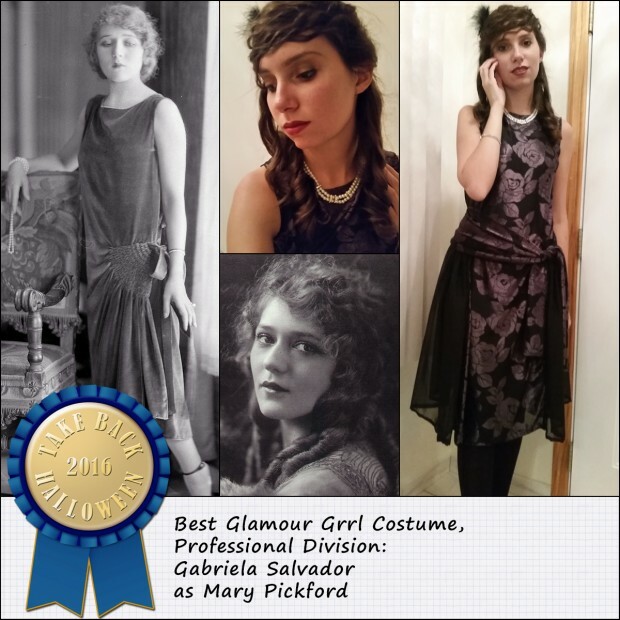 Winner: Gabriela Salvador as Mary Pickford. 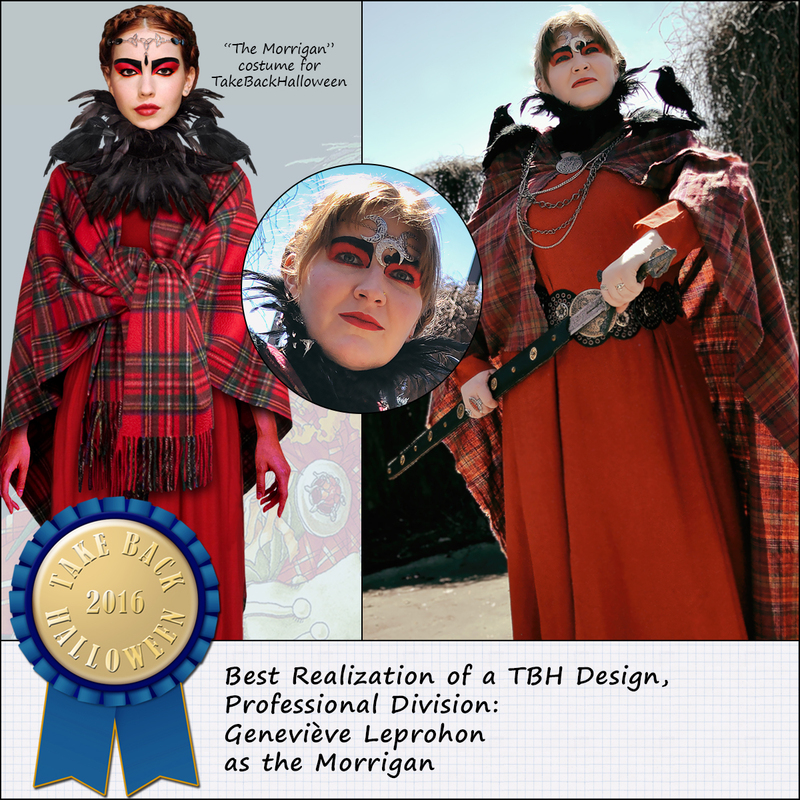 Winner: Geneviève Leprohon as the Morrigan. Winner: Monica De Souza-Griffith as Lady Isabella, Lady Elizabeth, and Countess Anastasia. Monica submitted three costumes for our contest, and we loved all three so much that it was impossible to pick one. Each ensemble is an exquisite symphony of colors, fabrics, and trims. LOVE. Monica’s talent for costuming is incredible, and every dress she makes is gorgeous. Congratulations to a genius costume designer and amazing craftswoman! Same categories as above, but for youthful humans. Winner: Sheri Schmitz’s daughter as Medusa. 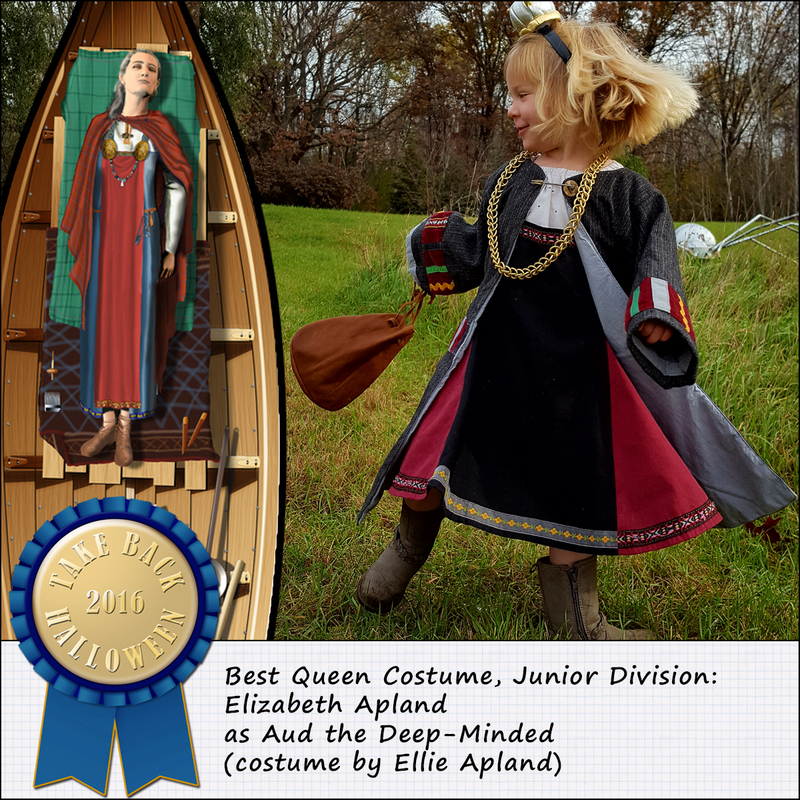 Winner: Elizabeth Apland as Aud the Deep-Minded, costume by Ellie Apland. 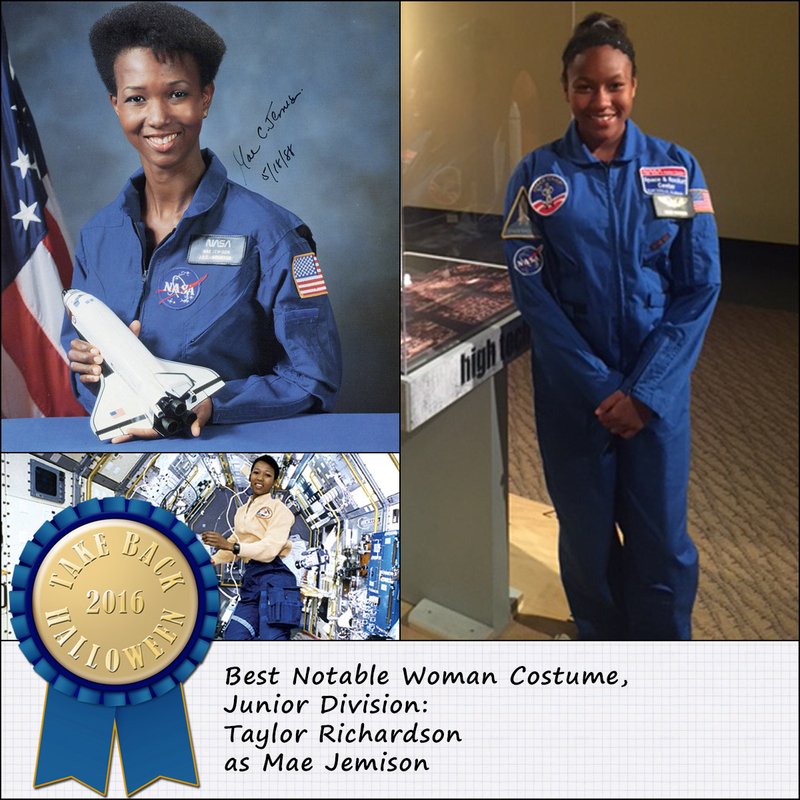 Winner: Taylor Richardson as Mae Jemison. Taylor Richardson is an amazing young lady: this 13-year-old aspiring astronaut is a Girl Scout, honor student, STEM and literacy advocate, triathlete, anti-bullying activist, Mars Generation Space Ambassador, and one of the youngest kids ever admitted to Space Camp. No surprise that the brilliant Mae Jemison is her idol. Taylor’s goal is to become the first African American woman on Mars, and we’re betting she’ll make it. 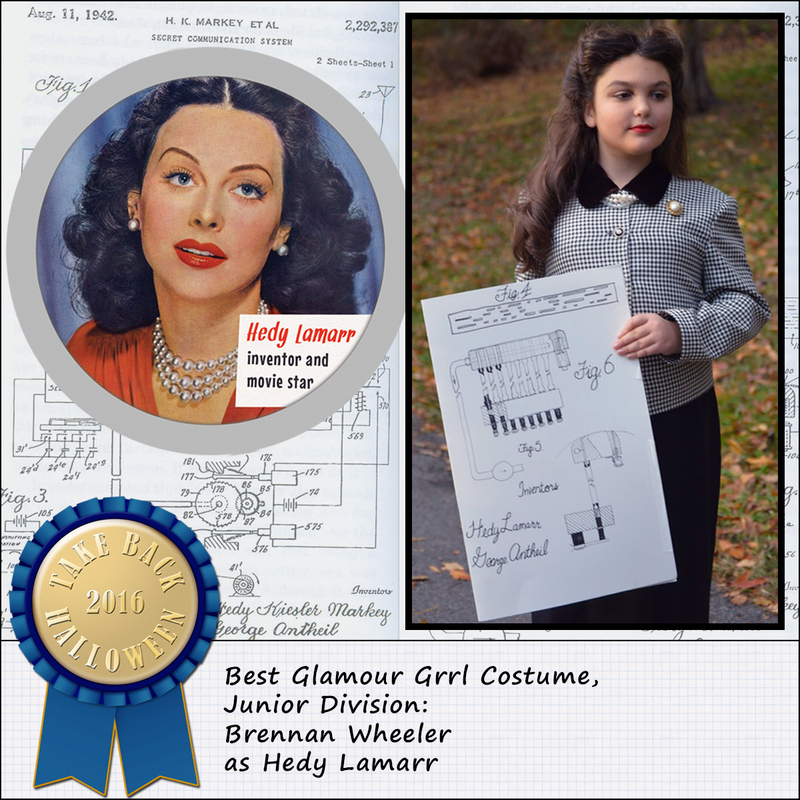 Winner: Brennan Wheeler as Hedy Lamarr. 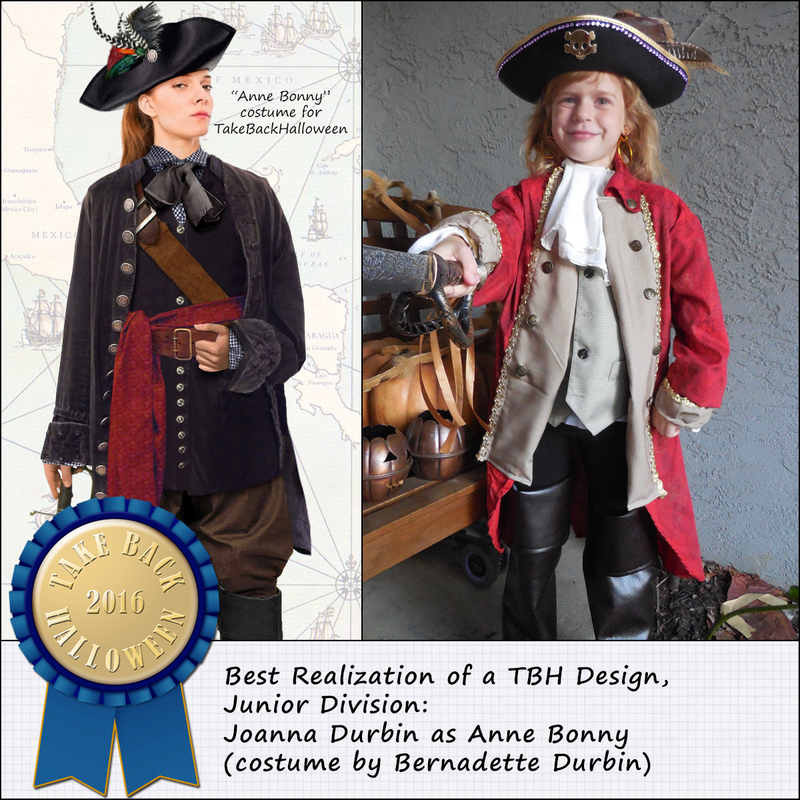 Winner: Joanna Durbin as Anne Bonny, costume by Bernadette Durbin. Winner: Maya Szakaly as a suffragist in grayscale. This costume seems especially appropriate this year, but it would be a winner any time. 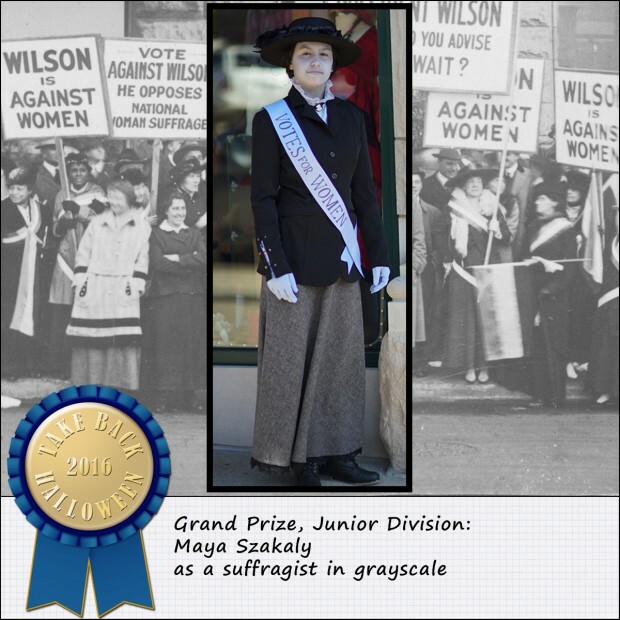 Maya has the 1910s suffragist outfit down pat, and the grayscale approach makes her look like she just stepped out of an old photo. Congratulations! This division includes the two special prizes we announced this year for Madam President and a Future TBH Mythological costume, plus a couple of unique achievements from this year’s contestants. On the Future TBH costumes, we really love all the suggestions that people sent. The two designs we picked are those that seem like they will work best for our site: they’re no-sew and easy to put together. We will write them up in detail later. Winner: Christina Davis as Shirley Chisholm. Shirley Chisholm was my personal hero as a child, and I remember very well wishing that she could really be elected President. 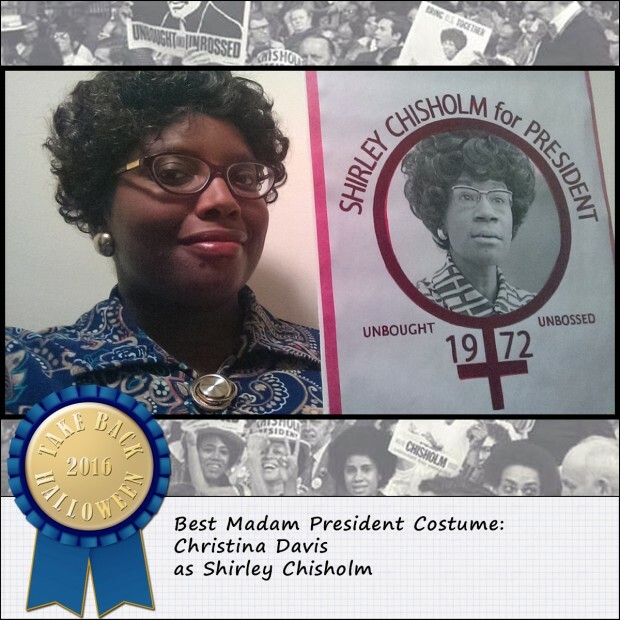 Christina did a wonderful job with this costume: perfect dress, perfect hair & makeup, and a sign that replicates the actual graphics used in the Chisholm campaign. Unbought and unbossed! 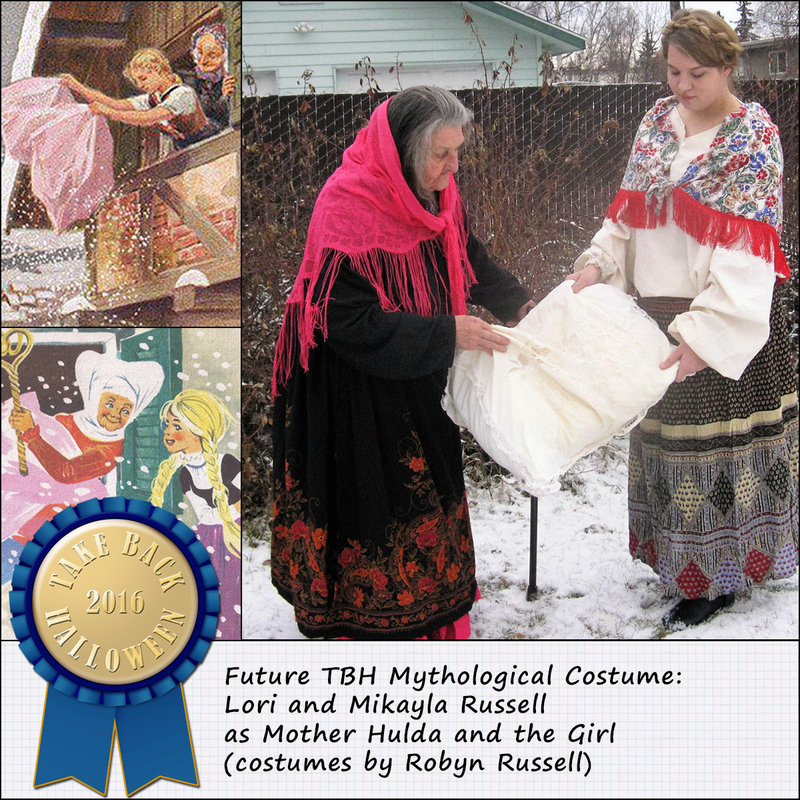 Winner: Lori and Mikayla Russell as Mother Hulda and the Girl, costumes by Robyn Russell. Mother Hulda was a costume candidate on our Kickstarter a few years ago, so we were thrilled to see this suggestion. Mother Hulda (or Frau Holle) is the fairytale version of an ancient Germanic nature goddess; when it snows, people say “Mother Hulda is shaking her pillows.” These delightful costumes were created by Robyn Russell and modeled by her 85-year-old mother Lori and her 19-year-old niece Mikayla. Lori’s family is of German descent, and when she was growing up in Iowa people would still talk about Mother Hulda when it snowed. 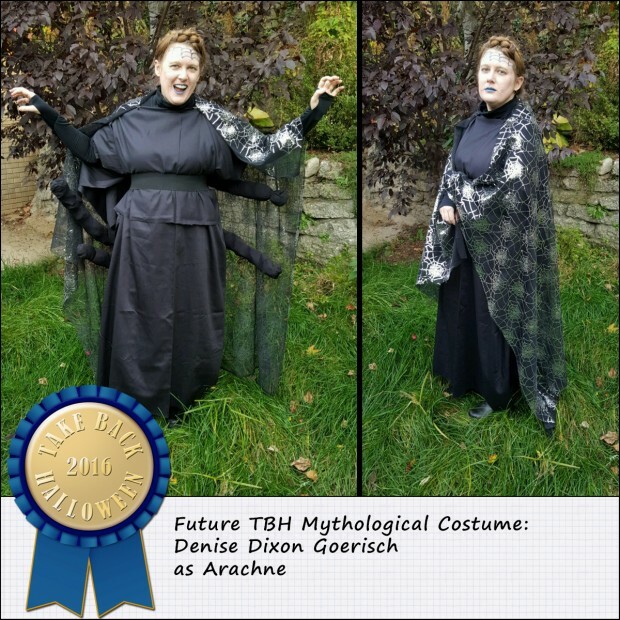 Winner: Denise Dixon Goerisch as Arachne. You all know the story of Arachne, who challenged Athena to a weaving contest and got turned into a spider. 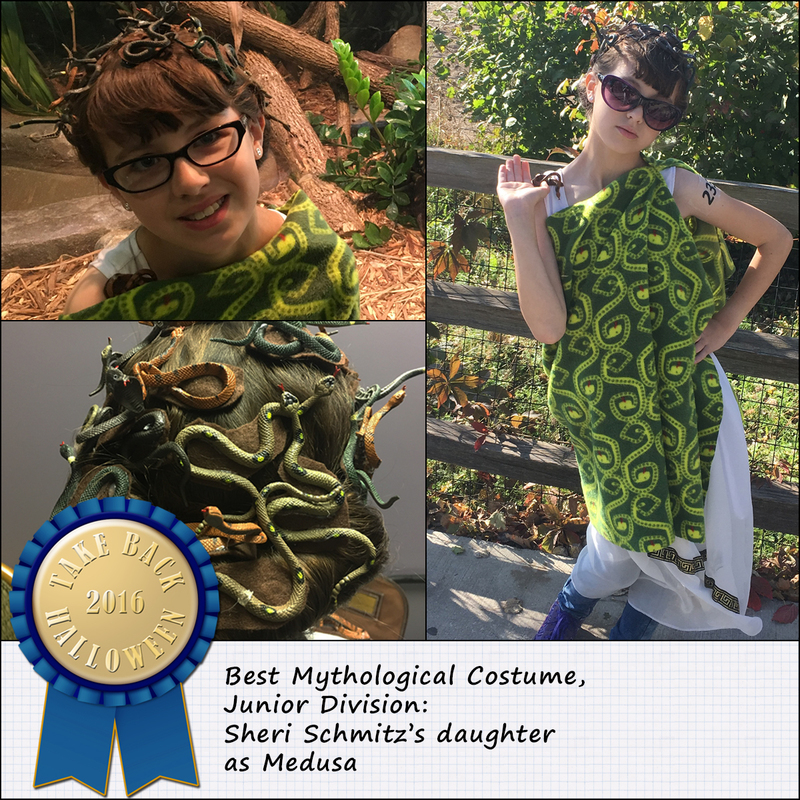 The great thing about Denise’s costume is that she keeps the Greek flavor, with a black chiton forming the basis of the ensemble. The spider legs are just black tights stuffed with plastic bags and attached with thread. Very clever! Winner: Laura Gill as an Amazon. 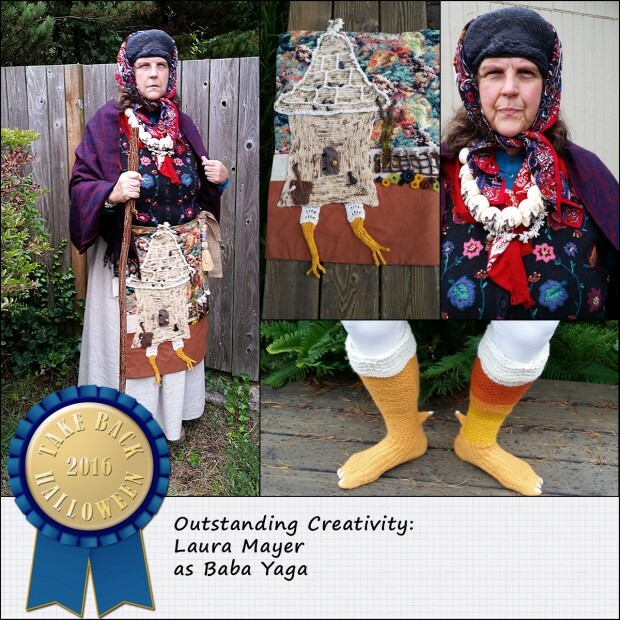 Winner: Laura Mayer as Baba Yaga. Laura Mayer wins the prize this year for Outstanding Creativity with her Baba Yaga costume, replete with knitted chicken feet and a chicken-legged hut on her apron. She writes: “I designed and knitted the chicken socks I am wearing. I also designed and knitted the hut I am wearing on my apron. I have tried to include many of Baba Yaga’s attributes in this piece. I used fabric with trees on it as the forest background for her hut. I knitted a small mortar and pestle and crocheted the fence next to her hut, which I adorned with plastic skulls and bones, and I included a black cat bead. I carried a small birch broom and the embroidered cloth and wooden comb that Vasilisa took from Baba Yaga’s hut. The bead flowers and birds and knitted tree were just to add atmosphere.” Congratulations, Laura, on a wonderful costume and a magnificent piece of fiber art. The last costume with the extra finger/claw on the sock is great!